When he arrived in Albuquerque as the founding dean of University of New Mexico's School of Medicine, Dr. Reginald Heber Fitz brought with him the solid foundation of a Harvard Medical School education and an independent pioneering spirit. 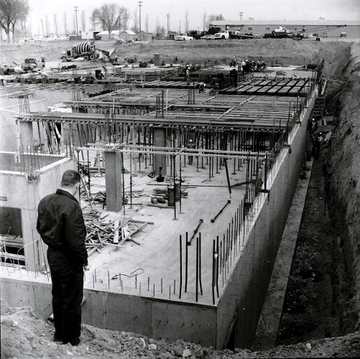 That spirit was recently recognized, as the UNM medical school dedicated its first academic building erected under the watchful eye of Fitz nearly 50 years ago. 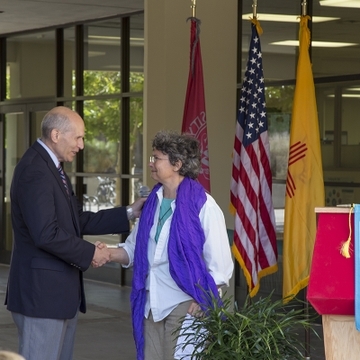 The School of Medicine's Basic Medical Sciences Building became Reginald Heber Fitz Hall Aug. 1 during a dedication ceremony on UNM’s North Campus, as Fitz family members looked on. 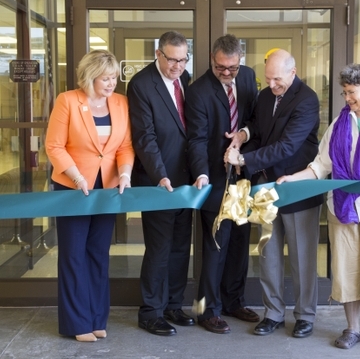 The building has been the site of many medical school accomplishments over the years, including the development of its groundbreaking Primary Care Curriculum, which integrates basic science and clinical education. Fitz came to New Mexico from the University of Colorado Medical Center after being aggressively recruited by then UNM President Tom Popejoy. When he and his wife arrived in Albuquerque in 1961, Fitz was the only member of the medical school faculty, according to Dr. Dora L. Wang, a School of Medicine historian whose book, "The Daily Practice of Compassion," will be published in December. "I had my faculty meeting in the bathtub," Fitz is quoted as saying in the book. "I never had an argument. I was the only person there." 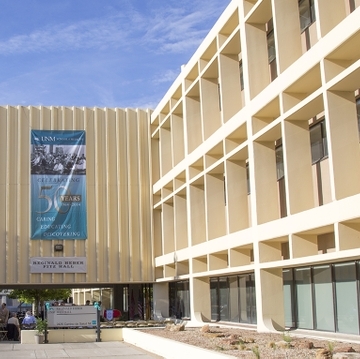 Fitz was intrigued by the notion of combining basic and clinical sciences in medical education – a precursor to the UNM Health System we know today, which integrates medical education with clinical patient care and biomedical research. Both his grandfather and father were Harvard Medical School deans. 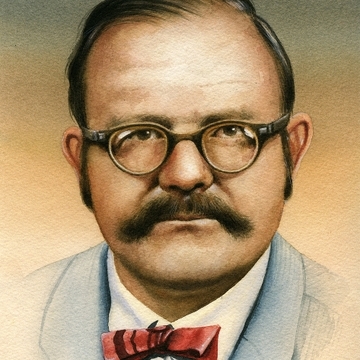 In 1961, with support from the New Mexico State Legislature and Popejoy, Fitz acquired a bottling plant and abandoned mortuary north of UNM’s main campus, recruited like-minded faculty from across the U.S. and began the launch of a medical school that has become a national leader in rural and family medicine programs. Fitz, who served as School of Medicine dean until 1968, died last year, but attending the dedication were three of his children who visited campus from California, Wisconsin and New York. A further testament to his legacy, all three are practitioners in the medical field. His daughter, Tracy Fitz, is an acupuncturist and herbalist; son Dr. Grahame Fitz is a family physician; and son Dr. Ralph Fitz is a cardiologist. “Dad imparted to us, and therefore to his students and educators, that healing has mystery and we should explore the creative possibilities in health,” Tracy Fitz said. 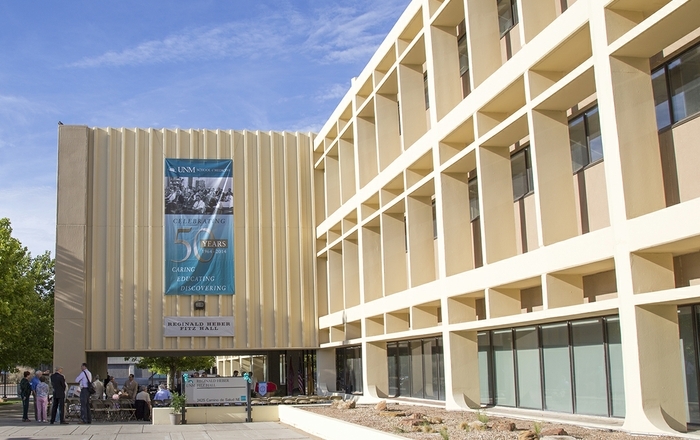 The Reginald Heber Fitz Hall dedication was part of the UNM School of Medicine’s 50th year-long anniversary celebration. 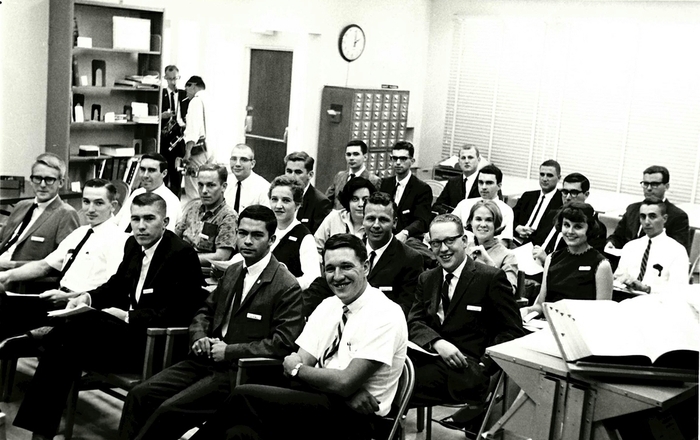 The school welcomed its first class in 1964, offering a two-year Basic Science in Medicine Program comprised of 24 students and 36 faculty members with six founding departments: Biochemistry, Molecular Biology, Internal Medicine, Pathology, Psychiatry and Surgery. The school began offering a four-year program in 1966.